It may not be well known that W. G. Bagnall Ltd., of Castle Engine Works, Stafford, introduced several novel locomotive valve gears which were used extensively on their products, and it is evident, when reading contemporary literature, that some confusion exists regarding their working principles and as to when they were introduced. I hope therefore that readers will be enlightened by this short article and ‘put on the right track’ so to speak. One of the early employees of W. G. Bagnall Ltd. (formed in 1875) was a Mr E. E. Baguley who later became the firm’s chief draughtsman. In 1893 he introduced the Baguley Valve Gear, which was patented on 12th June 1893, patent number 11,469. It is very novel and was used on many locomotives until the advent of a ‘modified‘ or ‘improved’ version. The gear is of the rocking sector type but the motion of the sector is obtained in an ingenious way. On the crankpin between the coupling and connecting rods is a third rod, on the other end of which is attached a forked link swinging on a fixed centre. The ends of this link are formed circular but offset to the pivots. On these circular bosses the sector is oscillated by a second link from the rod to an extension to the rear of the sector. Thus, the forked link imparts the lap and lead motion by swinging the link bodily on the pivots and the valve travel proper is given by the second link; the motion is then transferred to the valve in the usual manner by the die block and the radius rod. The first locomotive to be fitted with this Baguley Gear was an 0−4−0 wing tank, 1424 of 1893, built for the Northern Outfall Works of the London County Council at Beckton. 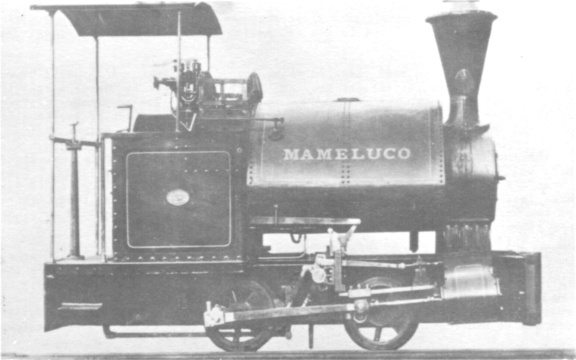 The valve gear is shown in Fig.1., on No.1475, MAMELUCO, a standard 0−4−0 saddle tank with 7in by 12in cylinders, built in 1895 to 2ft 5½in gauge for use in Brazil. The Baguley Gear was also fitted to No.1491 ISABEL, built for the Cliffe Hill Granite Co. Ltd. (Leicestershire), and now preserved outside Stafford railway station. A close−up of ISABEL’s valve gear is shown in Fig.2. The Baguley Gear was mainly used on the smaller narrow gauge locomotives hut on occasion was found on larger narrow gauge designs. For instance, it was used on a series of thirty−five 2ft 5½in gauge 4−4−0 tank locomotives built between 1897 and 1899 for the Egyptian Delta Light Railways. In 1895 the ‘modified Baguley valve gear’ was introduced. Here the radius rod is replaced by an extended valve rod which passes through a guide formed in the motion plate, and has a bushed end fitting over a small eccentric. The pin on which the eccentric rests is given a reciprocating motion by being connected to two radius links supported by a horseshoe-shaped casting. These radius links are connected by a pin which is moved up and down by a third link connecting it with an ‘eccentric’ rod worked from the crankpin similar to the earlier gear. The motion alone would work the valve had it not required lap and lead, and it is to provide for these that the valve rod runs on an eccentric which is caused to oscillate by its connection to the end of the rod driving the gear. It will be noticed that there is no sector in this gear. I think it bears the same relation to the earlier gear as ‘Baker‘ gear does to ‘Walschaerts’ in that the sector is replaced by rocking links or levers. The advantages claimed for this gear, and in fact for the earlier one, are the absence of overhanging parts and the ‘straight line’ motion from the crank pin to the valve. The ‘modified’ gear first appeared on No.1439, an 0−4−0 wing tank named IRIS, built in 1895 for the Bromley-by−Bow works of the Gas Light & Coke Company (Essex). 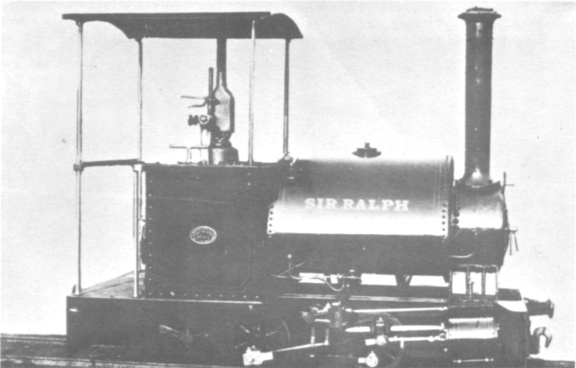 The gear is shown in Fig.3 on No.1610, SIR RALPH, a 2ft 9in gauge locomotive with 5in by 7½in cylinders built in 1900 for the Crown Agents for the Colonies. Very few locomotives had the ‘modified’ gear and the original gear appears to have been favoured for the majority. In 1901 Mr Baguley left Bagnall and his place was taken by Mr W. S. Edwards, who came from Kerr, Stuart & Co. Ltd., of Stoke-on-Trent. Mr Baguley, to the best of my knowledge, then joined the Army; however, he reappeared about 1915 as a Major and formed his own engineering company (E. E. Baguley Ltd.) in Burton-on-Trent. Only about twenty steam locomotives were built there, but all were fitted with one or other of his valve gears, including one on a standard gauge design. This was, I believe, the only one, as Bagnall never used the Baguley gear on any standard gauge locomotive. Fig.4 shows a Baguley locomotive fitted with the ‘modified’ gear. In 1903 appeared the best of the ‘Bagnall’ gears, namely the Bagnall-Price gear, which was patented jointly on 23rd May 1903 (No.11,832) by Mr W. G. Bagnall and Mr S. T. Price, the then Works Manager. This gear is, in fact, a re arrangement of Walschaerts gear, and is simpler than either of the Baguley gears. The expansion link is mounted on a rocking shaft which passes through a bearing bored out of centre in the rocking shaft bush, and is operated by a normal eccentric and rod from the driving axle. The rocking shaft bush is oscillated by a link connected to the connecting rod in the vicinity of the crosshead which provides the lap and lead motion. Advantages claimed for this gear are that it eliminates the combination lever and the return crank of the Walschaerts gear; large bearing surfaces are provided and all working parts are well clear of the ground. The original ‘Baguley’ gear and the ‘Price’ gear have one feature in common - the application of the lap and lead motion by oscillating the expansion link (or sector) bodily, and thus superimposing this motion on the. normal die block travel, the lead remaining constant in all positions of the gear. The Bagnall-Price gear was the most successful of all the gears introduced by Bagnall and was used up to 1953. 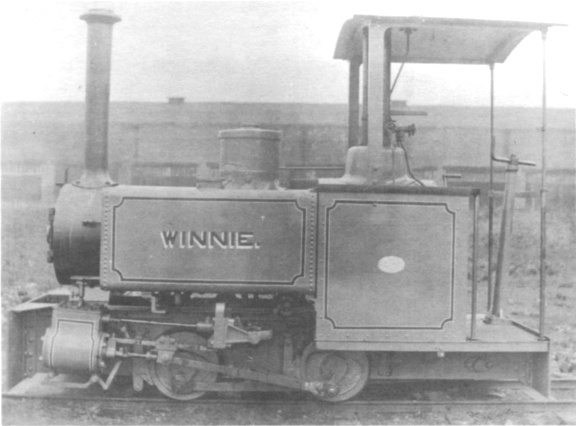 Its first application, as far as is known, was on No.1726, RICHARD BELL, a standard 0−4−0 saddle tank ordered in August 1903 for the North Wales Quarries Ltd. (Bethesda), but not delivered; it was sold, however, to the Orpington Ballast Company, St. Mary Cray Gravel Pit (Kent). There is a suggestion that the gear had been used some time earlier on No.1724, but no proof of this has yet come to light. The Bagnall-Price gear is shown in Fig.5, as fitted to No.1853 FERRET II, built in 1908. 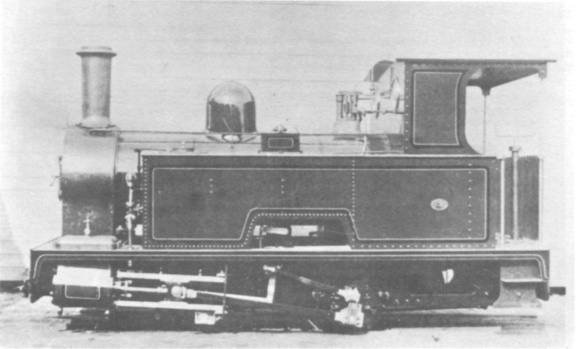 This was fundamentally a standard 6in by 9in cylinder locomotive for 2ft 6in gauge, but modified to suit the very low loading gauge of A. C. Bealey & Sons Ltd., of Radcliffe, Lancs. As from 1903 the Baguley gears were replaced by the Price gear on most of the small locomotives. From 1903 onwards, in fact, all the standard 6in and 7in locos were so fitted until about 1915 when Walschaerts gear was fitted as standard. However, the Price gear continued on special designs, as on the locomotive shown in Fig.6. 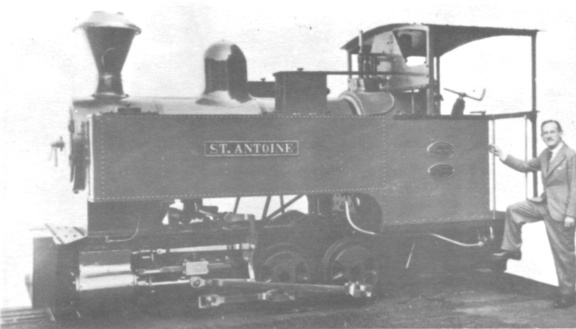 This is No.2827 ST.ANTOINE, a 2ft 5½in gauge 0−6−0 side tank built to a Kerr Stuart design for a firm in Mauritius. Bagnall-Price gear wag also used on small 4ft 8½in gauge designs, and the last such loco of a standard design to be so fitted was No.2702, an 0−4−0 saddle tank built in 1943 for Thomas Firth & John Brown Ltd., Monk Bretton (Yorkshire). Ten 0−4−0 saddle tanks built in 1947-1948 on 60cm gauge for the British Geco Engineering Co. Ltd., Turkey, were some of the last on the narrow gauge to carry this gear; they had 4½in by 7½in cylinders and a wheelbase of 2ft 6in. The last engine of all, however, to be fitted with the 'Price’ gear was No.3058, a standard gauge 0−4−0 saddle tank named ALFRED, built to a special low loading gauge for shunting at the privately owned Par Harbour in Cornwall alongside its older twin JUDY (No.2572 of 1937). The fourth gear was but a modification in the means of operating the ‘Price’ gear with an outside return arm and eccentric rod for swinging the expansion link, instead of the eccentric and rod from the driving axle. 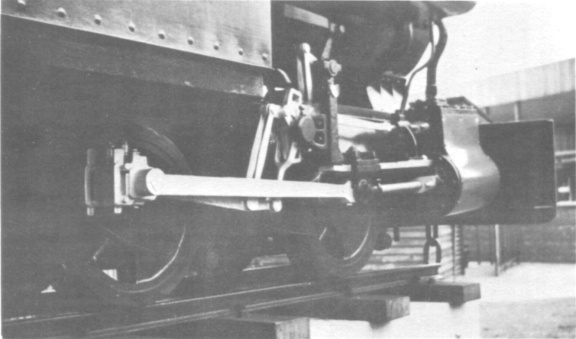 This modification was evolved for locomotives with outside frames, and is shown in Fig.7; this depicts No.1798, built in 1906 to 2ft 6in gauge for the Crown Agents for the Colonies, who delivered the loco to the Ceylon Government Railways. As a point of interest an engine with this gear is preserved in South Africa at the De Beers Consolidated Mines Ltd., at Kimberley, Cape Province. This is No.1814, OLIVE, an 0−4−2 with the water tank between the frames, hence the necessity for all the motion to be outside. One last variation of the Price gear was on engine No.1941 built in 1912 for The United Alkali Co., for use in an underground mine in Spain. It was an 0−4−0 saddle tank with inside cylinders 7½in by 12in, built to a very special loading gauge being only 6ft 1¼in high to the top of the chimney, the weight in working order being 7½ tons. The valve gear was all between the frames and was used because the low pitch of the boiler rendered all other gears impracticable. Named TEJON, a new boiler was ordered for her and despatched from Stafford in 1927. United Alkali had several more Bagnall locomotives but it is not known whether they were of the same design or not. 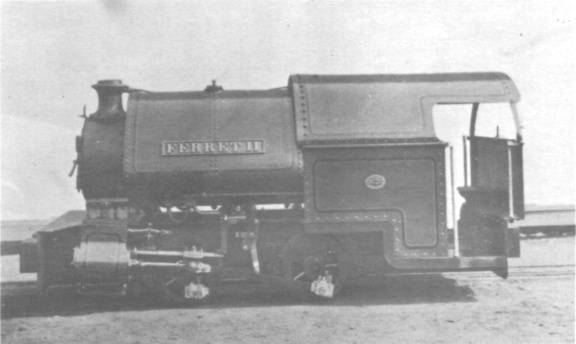 Finally, there is only one known instance of a locomotive not built by Bagnall having the Price valve gear, and this is KILRUSH, a 4−6−0 side tank built by the Hunslet Engine Co. Ltd. in 1912 to a Bagnall design. Bagnall had built KILKEE (their No.1881) in 1908, and both these locomotives were for the West Clare Railway in Ireland. In conclusion, I wish to express my gratitude to Mr M. G. Fell for his kind assistance, and to the English Electric Co. Ltd. and E. E. Baguley Ltd. for permission to reproduce photographs.